The late Professor Peter Willey is regarded as a world authority on the Ismaili castles of Iran and Syria which he had spent nearly a lifetime discovering and investigating. Eagle’s Nest, his final work, which is reviewed on this page by Valerie Gonzalez, was published in 2005 by The Institute of Ismaili Studies in association with I.B. Tauris. A Persian translation of the same was published in Tehran in 2007. Professor Willey passed away on 23 April, 2009, at the age of 86 years. Much scholarship was required to unravel the dark mystery of the medieval Ismaili community. Numerous historical essays and archeological reports, among them Fahrad Daftari’s extensive works, have provided an accurate view of the Ismailis within the Islamic tradition. But assuredly the latest release on the subject, Peter Willey’s book Eagle’s Nest: Ismaili Castles in Iran and Syria, brings invaluable new insights by accurately portraying the environment in which the life and struggles of the Ismaili faithful took place. There is no question but that this book offers a convincing tool for the deconstruction of the false myths which surround the cult of the Assassins. I read it, I must say, with great pleasure and am sincerely delighted to present it in this journal. More than a mere treatise on the archaeology of the Ismaili castles in Iran and Syria, Willey’s book shows multiple qualities. As an academic work, it fulfills its main objective which is to present the results of a meticulous description and observation of these fortified sites. The considerable amount of information contained in the volume reflects a near life-time of research devoted to the subject. Not a single pile of stones or rubble has escaped Willey’s acute attention, or skillful restoration in clear prose of the forbidding grandeur of the Ismaili military architecture. Each remaining element of structure is analyzed and appropriately resituated in the initial order both of the architectural organization of the building itself and of its broader setting within the coherent chain of fortresses spread over Ismaili territories. The material and documentation at the author’s disposal, including building scale, purpose, population levels and strategic importance have been patiently collected in order to present a reliable picture of the complex network of Ismaili strongholds. Maps, groundplans, photographs and even artists’ impressions and drawings complete the written work together with four appendices which include the castles’ inventory, a list of Willey’s expeditions and two catalogues of the ceramic and coin artifacts dating from the Alamut Period found at the site. Beyond the high quality scientific report based on the archeological record, Eagle’s Nest offers a brilliant reconstitution of Ismaili material culture from an historical, intellectual and sociological point of view, from the 11th century through the Mongol destructions of the mid 13th century. Willey restitutes the very meaning of the architecture he studies through the history of its builders and inhabitants, pointing out the most significant events of their lifetimes and portraying the great spiritual and political leaders of the Ismaili community. Methodically and surely, Willey describes the intricate historical background of the Ismaili State in which multiple powers confronted or fought each other, including Seljuk Turks, ambitious Sunni and Shii’a rulers, Crusaders on the Mediterranean coast, to propose his own interpretation of the historical evidence. Where evidence lacks or where persistent misconceptions require redress, the author proposes and defends critical hypotheses. The historical and cultural dimension of Willey’ archeological investigation is particularly enhanced by the presentation of certain situations and events as literary narratives, as he does in the beginning of chapter 2, “Hasan Sabbah and the Ismailis of Iran”. The passage in question relates the capture without bloodshed of the Alamut fortress under Seljuk authority and begins thus: “It was nearly noon on a hot day in the early summer of 1090. Mahdi, the lord of the castle of Alamut, was beginning to sweat a little” (p. 21). In this way, the author makes us relive the extraordinary event in a human atmosphere that is quite uncommon in scholarly works. Eagle’s Nest begins with the author’s preface and introduction. In it Willey depicts the background and popular history of the Ismailis with its collection of misleading clichés, legends and historical sources including Marco Polo’s fabulous account of supposed travels among them. Then he situates his own work within the scholarly tradition on the Ismailis through a detailed exposé of the most important contributions and authors. A brief statement on the main phases of his research and acknowledgments complete this introduction. Chapter 1 presents the early history of the Ismailis. The emergence of the Nizari community is explained in the general context of Medieval Islam and the great dynasties that have ruled in the period, the Sunni Umayyads and Abbasids, and the Shii’a Fatimids. The introduction forms a prelude to Part One, that, from Chapter 2 to Chapter 5, focuses on the history of the Nizari Ismailis following the Fatimid episode. Willey explains the foundation and step-by-step evolution of their state led by the two major figures, Hasan Sabbah in Iran, and Rashid al-Din Sinan in Syria. Through these fascinating pages the reader can follow the development of a bright culture promoted and defended by exceptional individuals under the toughest of circumstances. Willey shows well how this culture actually arose out of regional conflicts involving the diverse components of a heterogeneous Muslim society on the one hand, and foreign invaders from both Europe and the Far East (Crusaders and Mongols) on the other. The Nizari civilization is in fact characterized by intense efforts to cultivate a solid elite, secretive religious practices, complex relationships with the dominant Muslim communities and particular methods of warfare and survival. Part two of Eagle’s Nest is dedicated to the study of the fortresses themselves. Chapter 6 introduces the reader to the sophisticated strategy of building and capturing these fortresses as elaborated by the Nizaris in order to structure their State and shelter centers of Ismaili culture and spirituality. In this chapter, Willey underlines the essential principles of this strategy such as the careful choice of a location which was difficult of access while offering natural resources sources of food and water. To help the reader comprehend the siting of Ismaili castles, the author cleverly locates these within the wider network of military architecture as general phenomenon of the historical period. Crusaders and Muslims alike built remarkable fortresses in the Middle East. Western memory however, has selectively retained the architectural achievement of the Latins while underestimating that of the Muslims. Willey corrects this view by means of an overall comparative analysis of existing fortresses, a useful critical approach that he applies with good results to case studies in the subsequent part of the book. Chapters 7 through 12 cover the various areas of the Iranian Ismaili strongholds. Willey naturally begins with the fortresses in the famous Alamut Valley of the Alborz Mountains, the fortress in which the infamous legend of the “Assassins” took place. 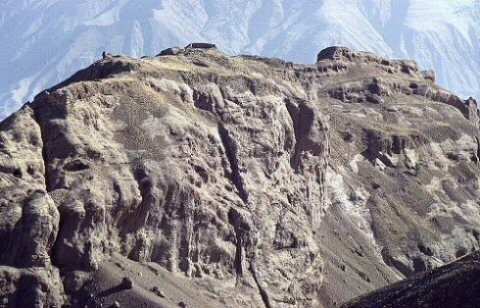 Alamut fortress constituted the very heart of the Nizari State in Iran and was the seat of Hasan Sabbah. 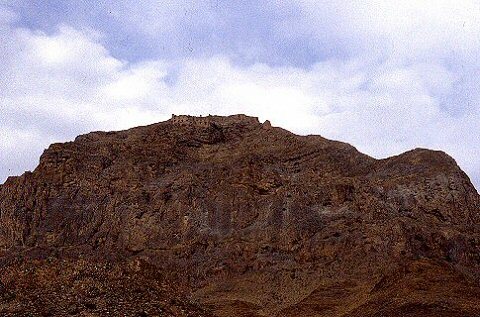 Alamut and its sister fortresses represented the epitome of Ismaili military science. Willey presents it with a rigorous method of sketching, measuring and enumeration of the construction’s features and structures, topography, architectural configuration, water equipment, cisterns, underground storage, garrison quarters and so on. The Alamut castle like many of the Ismaili strongholds contained facilities for religious activities and higher learning such as libraries. To support his observations, Willey quotes several times the Mongol historian, Juwayni, who witnessed the surrender of the Alamut fortress among other similar events. Although this chronicler was hostile to the Ismailis, his detailed reports offer an invaluable source of information. In particular he inspected the Alamut fortress’ interior prior to destruction and mentions, not without admiration, its remarkable facilities (p.100). Indeed, the sophistication of their architecture allowed the Ismailis to resist the fiercest attacks while ultimately succumbing to the formidable Mongol war machinery. Willey relates with great empathy for the desperate inhabitants the dramatic capture and systematic destruction of Alamut and other Ismaili strongholds. After Alamut, Willey investigates the other Iranian Ismaili castles of the regions of Qumes, Khorassan, Qohistan and in the surroundings of the Seldjuk capital Isfahan. 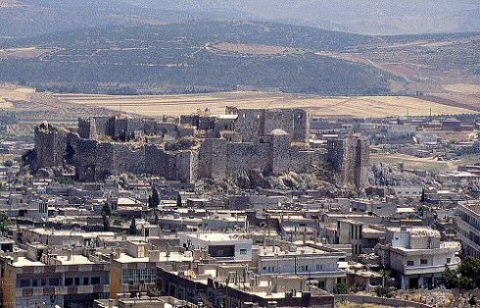 The castle of Khawabi is about 20 kilometres from Tartus in Syria. It is 350 metres long and 200 metres wide. The town surrounding the castle was reoccupied by a group of Ismailis in the nineteenth century who still live comfortably in its ancient buildings. Khwabi is the only remaining example of a fairly complete Ismaili castle. In chapters 13 and 14, Willey opens the way to Syria where the Nizari network of castles formed a connected but quasi-independent State from the Irananian counterpart. 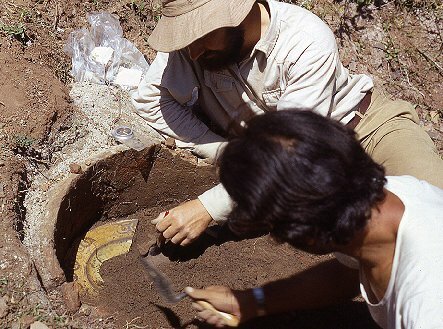 The method of examination of the sites is the same, combining archeological and historical documentation. 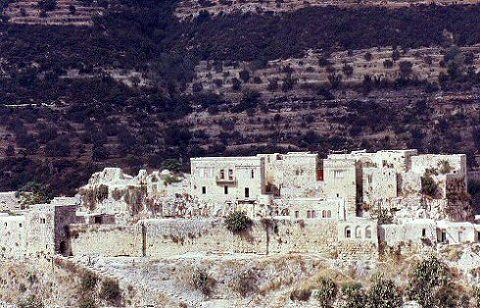 But in this area, the proximity of the Crusaders’ military architecture whose most famous construction is Krak des Chevaliers, gives the author the opportunity to develop a comparison between European and Ismaili fortifications. This enlightening comparison not only shows again the great talents and intelligence of the Ismaili builders but easily challenges the common notion according to which European fortresses represent the greatest achievement of medieval military architecture. 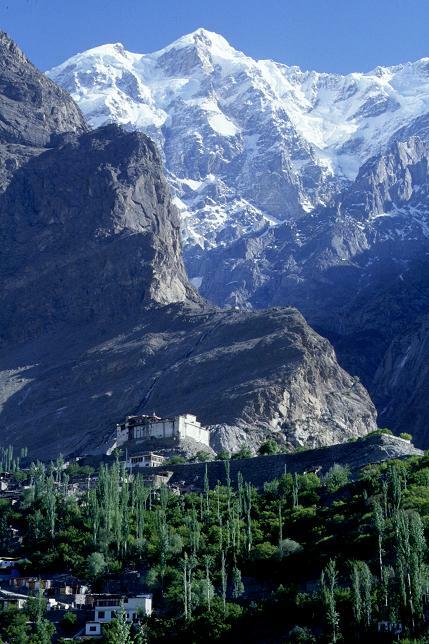 It’s not very often that a monarch willingly relinquishes his own castle, but Ghazanfar Ali Khan II, a descendant of the ruling Mirs (or Kings) of Hunza in Pakistan’s mountainous north, believed that his ancestral home, the Baltit Fort, would be better off in the hands of someone who knew how to take care of it. Seven hundred years’ worth of earthquakes, avalanches and neglect had turned it into a rubble-strewn heap, prompting the Mir to turn it over to the Aga Khan Trust for Culture in 1989. The charitable foundation embarked on a restoration, which took six years and more than $3 million; – and the results are stunning. Taken apart stone by stone and rebuilt using both modern and traditional methods, the fort has risen from its ruins. New foundations stabilize the ancient walls, and polymer mesh strengthens the façades that so magnificently overlook the Hunza Valley. In the 1920s, a British traveler described Baltit as “the most amazing fortress ever built.” Today, it would be fitting to describe it as the most amazing fort ever rebuilt. (From Time Magazine’s Best of Asia issue, by Aryn Baker). Chapter 15 occupies a special place in the book. It relates Willey’s trip to Northern Pakistan where he visited two important Ismaili monuments: the tomb of Naser Khosraw, the celebrated Ismaili poet, philosopher and writer, in Badakhshan, and the fortress of Baltit beautifully restored thanks to the Aga Khan program of restoration of Islamic architecture. These last pages invite the reader to a virtual journey filled with spiritual and aesthetic emotion and spectacular landscapes. Lastly, in Chapter 16, Willey terminates his book with a moving epilogue in which he shares a few of the thoughts, feelings and questions raised in his heart and mind by the exceptional fate of the Ismailis. He naturally mentions the remarkable endeavor of the Aga Khan’s organization for the development of both Ismaili and Islamic culture in continuation with the educational tradition of the community since the Middle Ages. 1. Book review originally appeared in REMMM (Issue 123|July 2008) and is reproduced on this web site with the kind permission of Revue des mondes musulmans et de la Méditerranée. Please visit their web site at http://remmm.revues.org. The journal is Copyright. 3. Please visit the Institute of Ismaili Studies web site, www.iis.ac.uk, to read further details about the castles shown on this page. The web site also describes other Ismaili forts as well as carries an interview with Professor Willey. What wealth of knowledge contained in the history of the institution of our Ismaili Imamate in this article offering many links and further reading of books to pursue for anyone who wants to know more! I for one, although had visited Masyaf in Syria, where our Imams lived in Dawr al-Satr in the period of turbulence during this phase, I shall have to return to this article and digest it slowly. My deep appreciation and thanks to Malik Merchant, Editor of http://www.simerg.com for his on-going efforts for this website. A delicate articulation with passion, devotion and intellection. I stop here because you have to read the book. Master pieces of scholarly work are coming within reach of our youth and Ismailis in general, thanks to dedicated scholars like Wiley who spent almost a life time in unearthing details and architectural finds as described in his book “Eagles’s Nest.” And thanks a million to the Aga Khan foundation in restoring this one of a kind fortress like Baltit as well as some others. Thank You Hazar Imam for the forsight. Brilliant work to revisit historical places…. Another brilliant article. Thank you. Greatly enjoyed this review as well as the book…and I thoroughly enjoy the website. I wish I had more time to peruse the remarkable array of articles and writings in greater detail.